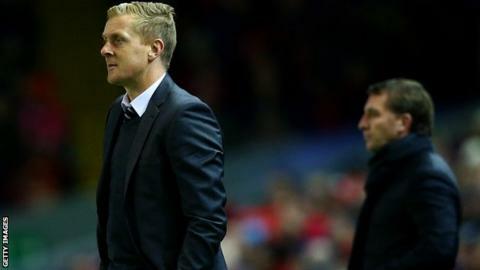 Swansea City manager Garry Monk says his side's mistakes cost them in the 4-1 defeat to Liverpool. Liverpool's second and fourth goals came from Swansea errors, goalkeeper Lukasz Fabianski's clearance rebounding in off Adam Lallana and Jonjo Shelvey heading into his own net. Monk believes those errors were the deciding factor in Swansea's heaviest defeat of the season. "We made too many mistakes. That's what cost us the game," he said. "I think we played okay. We had some spells when we had most possession and created some chances but ultimately the mistakes we made are what cost us the game." Victory saw Liverpool leapfrog Swansea into eighth place in the Premier League table, by virtue of a superior goals scored record. The hosts took a 2-0 lead with Lallana's block from Fabianski's clearance, though Monk refused to single out the Polish goalkeeper for criticism. "Lukasz has been fantastic this season and unfortunately a player makes mistakes throughout a season," he said. "You make mistakes like that at any level and you will get punished but especially at this level and against a team like Liverpool. "We lose as a collective. The way we lost the game is the mistakes we all made." Shelvey could face retrospective punishment after the midfielder appeared to catch Liverpool's Emre Can with a flailing arm. Monk, who had said before the game Shelvey needed to "wise up" after collecting "silly" cautions, did not see the incident. The Swansea manager said: "I will look at it and what will be will be." Liverpool winger Raheem Sterling could also be the subject of retrospective action after he appeared to strike Swansea defender Federico Fernandez in the face. "I saw the commotion but by that point I had turned my attention to somewhere else," added Monk. "I've been told that he flailed his arm out but again I will have to look at it on TV."